Kingfisher's encyclopedias are award-winning, information-packed reference books for all the family. The new, updated editions are beautiful versions of these trusted favorites--perfect for gifts and reference alike. 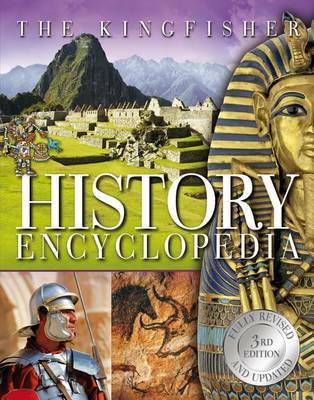 If you want one history encyclopedia, this is it!History leaps from the page in this completely revised and updated edition of the critically acclaimed "Kingfisher History Encyclopedia "by the editors at Kingfisher. From man's earliest history right through to the technological and social revolutions of the current day, this trusted reference provides a one-stop source for research, and is the perfect companion to any study of world history. The encyclopedia is organized chronologically and then thematically within each time period. A timeline runs across the top of each page for context. Each section includes biographies of important people and key features on the art, architecture, and technology of the period. No more hunting and pecking all over the internet for incomplete or un-vetted information. With 3,500 indexed references and more than 2,000 full-color illustrations, photographs, and source materials, as well as research-friendly back matter and index, this encyclopedia provides a beautiful, authoritative reference that is essential for any home, school, or library.